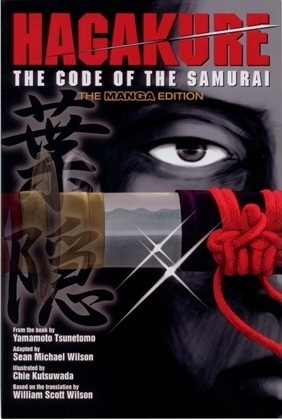 Published by KODANSHA in 2010; Hagakure: The Code of The Samurai has been adapted from translations. It comes from the popular spiritual guide of the same name. With the help of Sean Michael Wilson and Chie Kutsuwada it has been crafted into a comic. Hagakure: The Code of The Samurai is the collected commentary of philosophy from Yamamoto Tsunetomo, a well-known and respected samurai of the Edo Period. Hagakure talks about how one goes about life though various parables and how to take the appropriate action. Hagakure starts out with Tsuramoto Tashiro, a young scribe, finally finding Tsunetomo Yamamoto. Tashiro asks Yamamoto to allow him to write down all the philosophies and stories he has heard throughout his life. Yamamoto humbly agrees and immediately starts to spout out a parable. In each chapter you will hear stories of numerous people either being an example of the correct choice or the wrong one. Hagakure comes in a protective sleeve complete with a face that graces the front of the cover. If you take off the book sleeve it transforms into a simple black book, which really just blends into the environment. While reading you many find yourself thinking how to react if you were there during that time. Most of the time you see that killing becomes the answer to these situations, Hagakure’s philosophy, “living as though one was already dead” is the way of Bushido and can be found throughout its text. Each parable becomes reinforced though its artwork. Faces are draw simply and backgrounds are almost nonexistent. The art in Hagakure can be described as decent. Characters look similar as if there are a bunch of clones running around. Only some will be draw differently with a close up of their face. When there are backgrounds shown they generally tend to look well drawn. Sean Michael Wilson has been writing comics since 1998 and there are numerous and notable facts to be said about him. For instance, he is most likely the first British comic book author to have his work available on mobile phones in Japan; as well as have a multi-book deal with KODANSHA. The artist Chie Kutsuwada works at various places around the United Kingdom and even runs works shops for manga. She has had publications as far back as 2006. In 2008, Chie came in 6th place in the Manga Jiman competition held by the Japanese Embassy. Hagakure: The Code of The Samurai tries to be philosophical, but just comes up short. These are the writings of a renowned samurai; yet most of his solutions seem over bearing. It seems that the way to solve a majority of your problems is by killing. Rather than blow it off or talking it through it seems the preferred method is mindless killing. It ties back to “living as though one was already dead”; by not fearing death you can overcome anything. While flipping through Hagakure, you will notice how the paper feels; the quality is superb, being light yet durable. You do not feel as though it is printed on tissue paper and there for not having to daintily turn each page. It nicely gives a little incite in the world of samurai and how they acted. 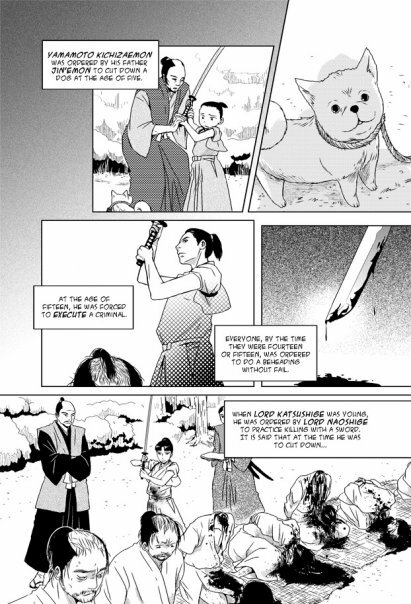 While reading I noticed that the text becomes heavy with Japanese names, such as in Lone Wolf and Cub. This seems unnecessary considering that most of the people introduced will die within their stories. They could have easily used titles rather than full names. Most if not all the textures in Hagakure are computer generated, so this is very distracting while reading. The textures take you out of reading and make the artwork look atrocious and becomes off putting when looking over the panels. 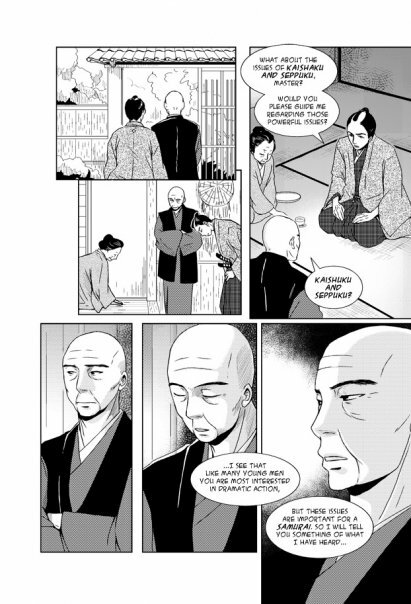 Here at Children Of The Blazing Fist, we had a hard time discerning whether or not to consider Hagakure: The Code of The Samurai either manga or comic. The lines were blurred between what we define as one or the other that we finally decided on comic.